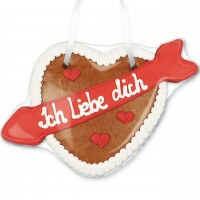 The ideal gift for your sweetheart can be found here: the original gingerbread heart with arrow! With the three most important words in the world, you can show that Amor has not missed his target. Your message of love is written on delicious gingerbread and can be eaten afterwards. Make your loved ones day!